Now that we've taken Ava to meet her two living great grandparents on Larry's side of the family, we decided we were long overdue to begin taking Ava to see her great grandparents on Krista's side of the family. 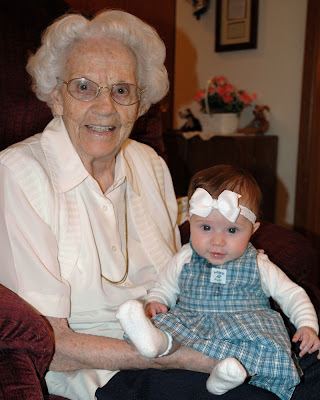 We decided to go visit Great Grandma Gibson for Family Home Evening. So last Monday we woke up Ava and told her we had an exciting activity planned for that evening. We told her of our plan, and as you can see, she was very excited. 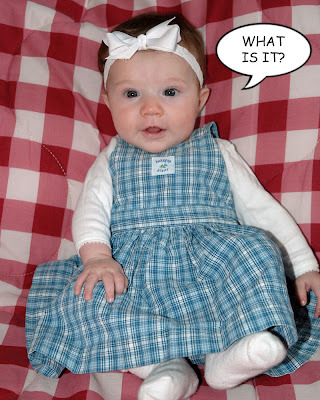 Since Grandma Gibson grew up on a farm, we decided to dress Ava in a Dorothy dress. Unfortunately we didn't have any red ruby slippers. 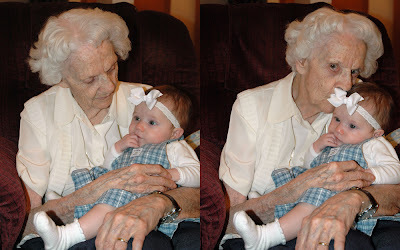 Ava had a fun time visiting with Great Grandma Gibson, who has a total of 33 great grandchildren, of which Ava is munchkin number 31. We also enjoyed the visit; and Grandma Gibson told many fascinating stories about her life. We especially liked the stories about her late husband (Grandpa Olsen) and about how her son Fred (Krista's dad) didn't like milking cows, which was a shock to us seeing as how he was the rodeo king. We were hoping to see Great Grandma and Grandpa Beckstead last Friday while we were up in Logan attending a wedding for Krista's cousin Laura, but unfortunately they were both sick. We look forward to seeing them later this summer. Krista...she's just too cute and so happy!! 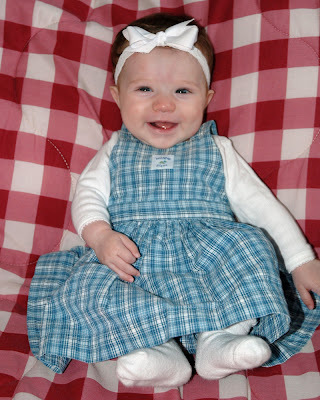 I love her little outfits and her smile...she's beautiful!! We gotta get together again soon!! I was checking your blog this morning with Vanessa looking on, and she got all excited and said, "Baby Ava!" She remembers you guys. I know I said it before, but Ava sure is a cutie!